It’s been quite a ride for Worcester Regional Airport over the past two years. Two years ago today, JetBlue announced that Worcester would be its 80th Blue City flying from Fort Lauderdale and Orlando, Florida to Worcester. 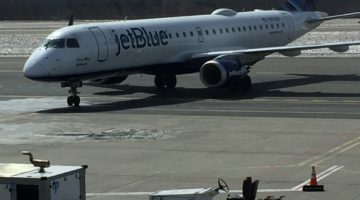 After many months of “wooing” JetBlue, the airline had officially announced its dedication to the airport from the continuous support of the community and local leaders. On November 7th, 2013, JetBlue flight 2019 took-off into the sunset as being the inaugural flight for JetBlue at Worcester Regional Airport. Since November 7th, many things have transpired. Many people did not believe that the airline would last only carrying passengers to Florida destinations. JetBlue’s starting strategy for Worcester was to target leisure passengers first. Fort Lauderdale and Orlando are JetBlue’s two biggest hubs down South. Each of them offers connections to destinations in the Caribbean, Central, and even South America. In my opinion, JetBlue flying to Fort Lauderdale and Orlando was the best starting strategy the airline could offer. Worcester Airport customers held their own, maintaining loads to Ft Lauderdale and Orlando in the 80-95% range. What was surprising about the two routes was how well the two destinations kept up during the summer months. Since November 7th, JetBlue has seen some really positive activity going on with Worcester. Unfortunately, throughout this year and a half there have been some negatives. 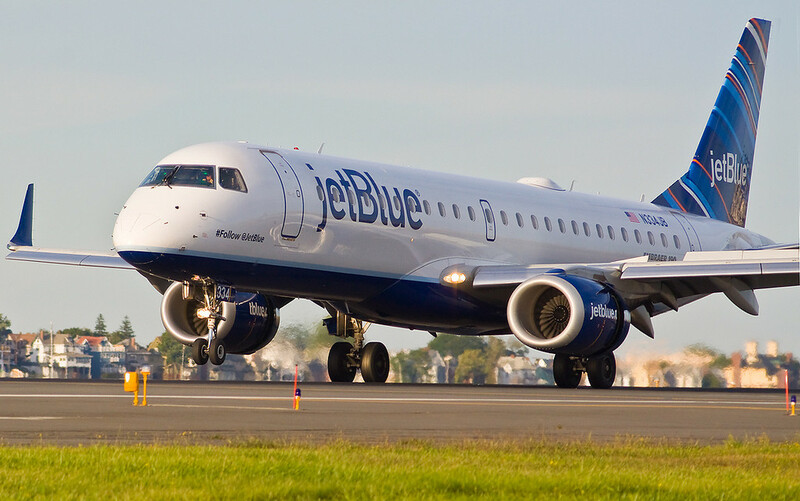 The biggest problem that JetBlue has had at ORH is the unpredictable weather. Airport hill (being 1000ft +) tends to be an attraction for dense fog. With low visibility conditions on the hill, planes cannot land, resulting in JetBlue diverting to Boston or Providence. Fortunately!!! Airport officials and Massport are revising that problem. A Category III landing system is currently in progress at Worcester Airport. This Category III landing system allows planes to land in various weather conditions, and close to zero visibility weather conditions. Until the Category III landing system is installed, I do not see any other airlines flying to Worcester anytime soon. JetBlue is a leading business in aviation. Other airlines like Southwest, Delta, American, etc. are all going to wait to see JetBlue’s success at the airport, before making any kind of commitment to Worcester. The #1 thing that central mass people can do now is buy tickets out of Worcester. We need to show JetBlue that we are committed to ORH. Hypothetically speaking, lets say I am planning a one-way trip to Florida in May with a date chosen randomly. 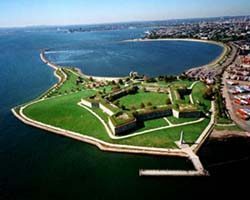 I go on JetBlue.com to see all available flights from the Massachusetts area by searching Boston Area to Ft Lauderdale. If you select “Boston Area” as the origin, you will see all flights from Boston, Worcester and Providence. 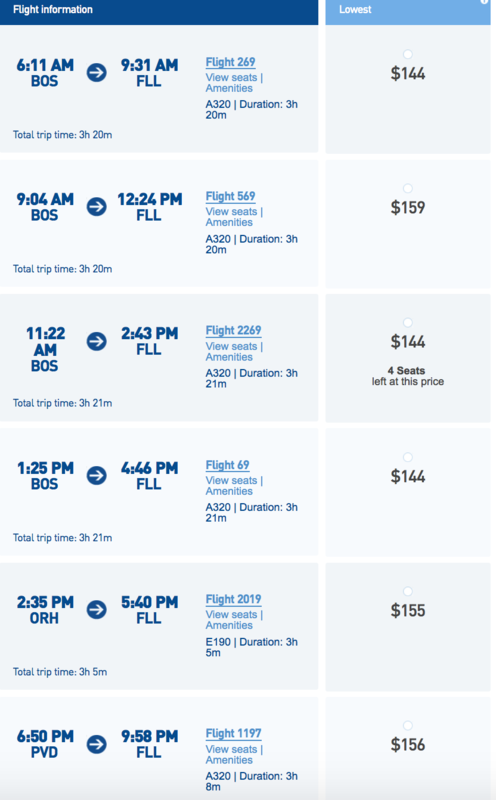 As you can see from the picture, the cheapest flight fare to get down to Ft Lauderdale is to take the 6:11am, the 11:22am or the 1:25pm flights from Boston for $144.00. 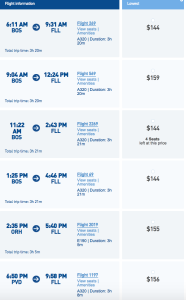 The flight from Worcester Airport is $155.00 to get down to Ft Lauderdale. It’s simple! 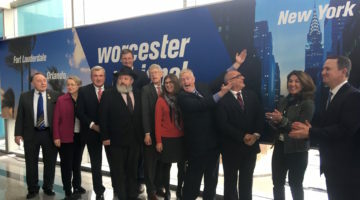 Choose Worcester — no tolls, no highway, all with inexpensive parking!